If you are looking for information on the Always Best Care Senior Services franchise business opportunity, Always Best Care non-medical home care franchises or Always Best Care franchising, then you have come to the right place. In a changing economy where bright spots are hard to find, here is a shining star in senior care franchising. Always Best Care Senior Services is right in the center of the senior boom. With 13 million people becoming seniors by 2020, this is truly an extraordinary opportunity for you to secure your future. We see a bright future ahead, with 13 million opportunities to build great relationships! Driven by a passion to ensure that every senior is given the very best care, founder Michael Newman has instilled the following philosophy into every employee since 1996: caring is at the heart of everything we do. With that, Mike has surrounded himself with a team of dedicated and highly motivated people who have over 50 years of combined experience in the health care industry. Together, Always Best Care has cared for over 100,000 seniors. Now the Always Best Care Senior Services model is available for you to become part of. Join the growing team of people who share your same passion and dedication in this tremendous opportunity! "They have been there supporting us every step of the way." Two revenue streams - Always Best Care Senior Services is the only company to offer these two choices together: Non-Medical In-Home Care and Assisted Living Placement Services. Now you have the ability to provide seniors and their families with two options for receiving the best care in your own exclusive territory. What could be more rewarding? Non-Medical In-Home Care Services - specializes in helping seniors who wish to remain in the comfort of their home, but need assistance. ABC provides this service through well trained care provider staff and a support team. Assisted Living Placement Services - specializes in helping seniors who are unable to live in their own home transition into an assisted living facility. Assisted Living Placement Services is unique to the franchise world. The profit margin in this proprietary service is huge, and will give you that extra earning power that the competition does not have. 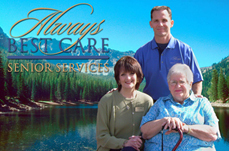 Always Best Care Senior Services also offers the industry's only all-in-one software solution! We call it the "Virtual Office". This fully integrated online business application supports your entire franchise. The feature consolidates business intelligence data and brings it to your fingertips. The Virtual Office brings you a single view of your entire business. Features include customized dashboards, customer support management (CRM), accounting, payroll, staffing, sales force automation, support management, and complete financials; this is just a small list of the features available through our Virtual Office Automation. On top of all the business features, the Virtual Office offers, it is Environmentally Responsible; you can run your business from anywhere with an Internet connection. Virtually no paper is required to operate your business. Caring for seniors and the environment; once again you can see caring is at the heart of everything we do. "The things that drew me to ABC were the Virtual Office, a one stop shop for all of your software and operational needs, and the low start-up costs." Once inside the Always Best Care Senior Services Franchise Team you will have access to our "Intra-net". There you will find a wealth of information, ranging from ready to print marketing flyers to guidelines on HIPAA. It's all at your fingertips. From here you will be able to make adjustments on your own franchise website. Training and support begin as soon as you join the Always Best Care Senior Service Franchise Team. You will spend five days here at our corporate office earning your franchise certification. Our commitment to training does not end when you graduate; we provide three days of training at your franchise location. Web training sessions covering a variety of topics are held monthly. Additionally, one of our seasoned specialists is available at all times via phone or Internet to support you.